Both the Brexit Referendum in the United Kingdom and Donald Trump’s surprise victory in the 2016 American Presidential election have resulted in a number of think-pieces analyzing the voting patterns and intentions of the white working class in both countries. While large cities like London and New York overwhelmingly supported the European Union (EU) and Hilary Clinton respectively, traditional bastions of the white working class, such as Erie, Pennsylvania and the North-West of England voted for Brexit and Donald Trump. Explaining why a majority of those in these demographic groups voted, often times against their economic interest, for conservative and reactionary ideas while abandoning the “traditional” parties of the working class has been one of the main themes of recent political and historical analysis of these two votes. One answer that has seemed to gain particular currency is that the progressive parties of the left have moved to the centre and abandoned the working class. In late March, in Le Devoir and here on ActiveHistory.ca, historian Steven High called this process the “gentrification of progressive politics.” While I certainly agree with the general contention High and others advance, I’d like to suggest that in order to truly understand these voting patterns we need to first consider white working class conservatism not as an historical aberration but rather, if we take Canada as a case study, as a phenomenon with a long history. First, let’s define our terms. While who constitutes the working class and what defines conservatism are two concepts difficult to pinpoint, for the purpose of this post I will rely on their conventional understanding. For the most part, white working class voters are those who are – or were – wage earners engaged in manual labour. Similarly, though definitions of conservatism can vary greatly, in the realm of electoral politics, we can use party definition as a proxy. In this case, the Conservative Party of Canada and its forebearers. Such definitions may well make things blurry at the margins but capture the general ideas that I wish to explore. The fact is that Canadian Conservatives – be they progressive or not – have had remarkable success at winning working class votes. Part of the appeal certainly was that the Conservatives were the party of the National Policy. They explicitly promised to first impose, then maintain, high tariffs that protected Canadian manufacturing from foreign competition. These policies were tremendously popular in Canada’s industrial heartland of Ontario, as Wilfrid Laurier and the Liberals found out in the 1891 and 1911 Federal Election, when a proposed trade deal with the United States led to majority governments for the protectionist Conservative Party. 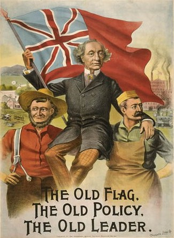 Most notably, in the 1891 election John A. Macdonald campaigned against the Liberals’ policy of reciprocity with the United States by overtly and successfully appealing to Canadian workers with his slogan of “The Old Flag, the Old Policy, the Old Leader.” The Conservative Party’s most famous election poster only reinforced their message of support for the working class, featuring a farmer and labourer hoisting Macdonald onto their shoulders. While the Liberals won a majority of seats in Ontario in the election, they were mostly rural ridings where reciprocity held tremendous appeal. The Conservatives still controlled the manufacturing cities of Southern Ontario. Furthermore, compared to the electoral victories of the Labour Party in the UK, Canada’s first socialist party had limited success in attracting votes from its supposed natural constituency of the working class. While the CCF was successful at attracting votes from the working class of Winnipeg, in Ontario and Quebec the CCF repeatedly lost to the Liberals and Conservatives. In the manufacturing cities of Ontario such as Windsor and Hamilton the CCF never managed to win a seat before their transformation of the party into the NDP. Rather, the base of support for the party was among farmers in the Canadian Prairies, particularly Saskatchewan, and resource workers in British Columbia. Even when the party was forming in the 1930s, Montreal academics F.R. Scott and Frank Underhill commented on the paucity of left-wing working class organizations upon which the CCF could build. In most Ontario ridings, the CCF had to start from scratch. It was only in rural Ontario with its economy centered around agriculture that the CCF was able to build on the organization of the United Farmers of Ontario. A possible counter to my argument is that by only focusing on workers employed in manufacturing or heavy industry, I have omitted the vast majority of working Canadians. Certainly, as Alvin Finkel correctly points out in his book Social Policy and Practice In Canada, prior to World War Two, the top two employers of paid labour in Canada were agriculture first and resource extraction second. Thus, a reasonable conclusion would be that the CCF’s success in Saskatchewan and BC makes sense given the economic base of each of those provinces. While true, such an argument overlooks the fact that Alberta, like Saskatchewan, whose economy was largely structured around farming and later resource extraction, has predominantly supported conservative parties, most notably Social Credit on both a provincial and federal level. Furthermore, the post-war success of W.A.C. Bennett’s Social Credit Party in BC as well as the success of the Reform Party in the interior of the province in 1992 and 1997 also speaks to an enduring appeal of right-wing populism in BC. Finally, Canada is not unique in this regard. When examined within the broader context of the British Empire, working class conservatism has a long history in the United Kingdom as well. Since the Second Reform Act of 1867 no party has governed Britain for longer than the Tories, despite an expanding franchise and economic changes that diluted the political influence of the landed aristocracy, the traditional base of Tory power. Indeed, while the Conservatives under Benjamin Disraeli were defeated in the 1868 election, the first after the Second Reform Act became law, in 1874 they won the first clear majority for any party in over fifty years, largely on the strength of the newly enfranchised working class vote. A superficial analysis suggests that the Tories were more attractive to many newly enfranchised men because of their vocal support for Imperial expansion and a greater willingness to embrace communitarian principles than the Liberals. While we often associate the British Liberal Party with the reforming initiatives of its most famous leader, William Gladstone and later “new liberals” such as Thomas Hobhouse and T.H. Green, the Liberals were, for most of the 19th century the party of the factory owners who opposed Tory legislation limiting working hours for women and children and supported free trade as it allowed cheap grain imports thus limiting any inflationary pressure on workers’ wages. Alternatively, Benjamin Disraeli’s vision of Tory Democracy and his seeming understanding of the plight of Britain’s poor, demonstrated in his novel Sybill or Two Nations, provided a compelling alternative for many working class voters. In contrast to the Liberal’s emphasis on the primacy of the individual, the Tories presented a communitarian image of society that preserved the elevated place of the rich, but also argued that the wealthy had a substantial moral duty to help all of society. Combined with a celebration of Britain’s empire and past glories, the 19th and early 20th century Conservative Party offered a much more compelling, if paternalistic option to many voters than the stark economic vision of British Liberal policies. Ultimately, at a most basic level, these examples demonstrate that class identity has largely been a unreliable tool for predicting political support. Certainly, in modern-day politics, be it Canada, the USA or the UK, there is a growing divide between rural, conservative areas and much more liberal urban areas with the white working class in these more rural areas embracing conservative politics. However, an initial survey of Canadian political history suggests that there is a long history of white working class voters embracing parties such as Social Credit or the Conservatives, even when there has been organized and mainstream left-wing alternatives. This history suggests that while the idea of the gentrification of progressive politics may well be a proximate cause for white voters rejecting left-wing movements and parties, there are deeper forces at work. It is the role of political historians in Canada and the rest of the English Speaking world to investigate and explain what these factors are. Adam Coombs is a doctoral student in the Department of History at the University of British Columbia. You touch on one potential explanation when you discuss how Disraeli Tory democracy advanced communitarian policies that appealed to the British poor. Canadian conservatism also has a history of advancing such policies when conservative parties are the ones in the driver’s seat. Here in Alberta, for instance, Peter Lougheed is widely considered to be our best-ever Premier, and he not only raised resource royalty rates, but actively reinvested that money into building schools, roads and hospitals. His Social Credit predecessor Ernest Manning, who governed for a whopping 25 years, also spoke about ensuring that the larger population benefited from the resource bounty. Even today, when two-tier healthcare is discussed in Alberta, the arguments to justify it are often that it would take pressure off the public healthcare system and shorten wait times, rather than any arguments about the supposed superiority of markets or arguments to liberty. Even that doesn’t necessarily cut it, as evidenced by the failures of Ralph Klein’s “Third Way” proposals. And at the national level, who can forget R.B. Bennett’s initial attempts to create a Canadian welfare state, only to be thwarted when his efforts were deemed unconstitutional? There was a reason historian P.B. Waite insisted that Bennett was a Red Tory. Similarly, in his book “The New Canada”, Preston Manning also specifically talked about and debunked the idea that the Reform Party wanted to abolish healthcare. That communitarian aspect of Disraeli Toryism has a similarly rich history in Canada as it does in the UK, and it arguably still does today in many circles. The correct spellings are Finkel, Hobhouse and Green. Hello. I am the president of my local for Canadian Union of Postal Workers. I googled conservative labour movement and this article was all I could find. I am looking for some intellectual stimulation regarding labour and Canadian conservatism. Any help? I really hate the “progressive” aspects of my union, and am looking for something that is more relevant to many of my coworkers.